The Sun Mountain trail system has over 30 miles of trails which offer a ton of flexibility. This trail, and the Black Bear loop are a couple of our favorites and they make superb running trails. They’re close to Winthrop and melt out pretty early in the year as well. From the Chickadee trail head, head very briefly down the Chickadee trail until its intersection with the Cabin Trail. Take a left and head downhill on this trail until you are just above the Sun Mountain Cabins and Patterson Lake at .8 miles. 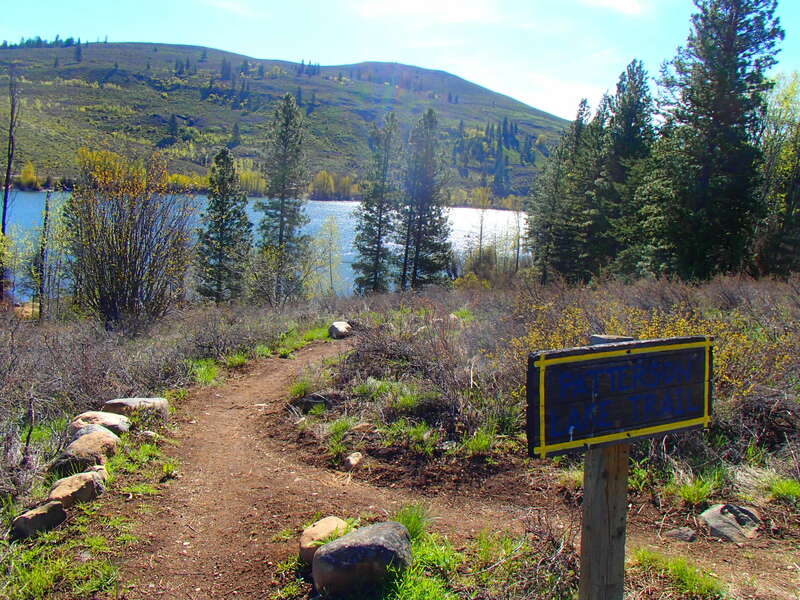 Head right on the Patterson Lake trail and follow this rolling trail along its namesake. There are a couple of nice swim spots along the way. At mile 2.5, just a little ways after passing through a swinging gate, bear right on Rader Creek Trail and follow this steadily uphill for another 1.5 miles. From the upper part of Rader Creek, there are a number of ways to get back to your car at the Chickadee parking lot. My favorite is to take a hard right onto the Magpie Trail. When you get to an old corral area take another right through a gate then take an immediate left to stay on Magpie. You will join back up to the Chickadee Trail which will take you back to the parking lot. Driving Directions: From Cascades Outdoor Store in downtown Winthrop, head East on Highway 20. After crossing the Methow River (.5 miles from the store), bear right onto Twin Lakes Road, heading past Winthrop Physical Therapy and drive 3 miles. Turn Right on Patterson Road and follow it 5.2 miles. You’ll pass Patterson Lake and then come to the Chickadee Trailhead sign pointing you to your left. Turn in and take a left and park in the large parking lot.